Rise Above likewise place teachers with an Australian missionary organization whose sole aim is to help poor children secure a future outside the slums, through helping them learn to read and write and preparing them for a full education. We visited this institution today, an oasis of hope smack dab in the middle of a garbage dump, accompanied by 3 Danish volunteers (pictured above) who had just helped out in a Rise Above feeding program. 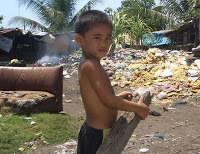 Many would find the conditions we encountered today as unbelievable, children and families living on and in a garbage dump, sorting recyclable trash as a way of eking out a meager existence, amidst flies and open sewers. Having said this, it always amazes me to experience how happy, friendly and buoyant these dear people are, a wonderful trait of the Filipinos. This year Rise Above is also undertaking a micro-finance program, providing loans to fund enterprising small businesses as a means of helping individuals out of their present cycle of poverty.